The sanitation workers of EDMC went on strike on September 12 demanding payment of dues including salaries of contract-based workers. 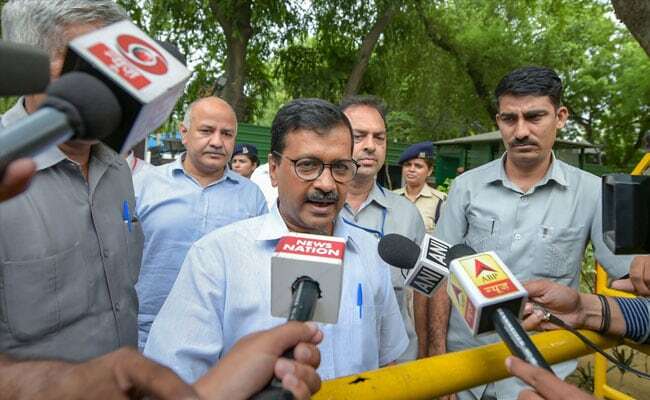 Delhi Chief Minister Arvind Kejriwal today slammed the Centre, saying it would have "immediately waived loans" of "a few rich people" but not giving money for poor municipal sanitation workers who were on strike for the last three weeks. The BJP accused Mr Kejriwal of "lying" over the funds given by the Centre to the EDMC. The sanitation workers of East Delhi Municipal Corporation (EDMC) went on strike on September 12 demanding payment of their dues including salaries and regularisation of contract-based workers. The Delhi chief minister claimed the municipal corporations have to be paid Rs. 5,000 crore by the Centre. "Last week Delhi government on the advice of Supreme Court paid Rs. 500 crore to the MCD. The Centre today denied to pay Rs. 500 crore, despite advice of the Supreme Court, although it has to pay Rs. 5,000 crore to the MCD. Is BJP responsible to Delhi like this? Then why should Delhiites vote for you (BJP) in LS election," Mr Kejriwal tweeted in Hindi. "It is so sad. If it were loans of a few rich people they (Centre) would have done it immediately but not paying money for sanitation in Delhi and poor sanitation workers," he said in another tweet. The leader of opposition in Delhi Assembly Vijender Gupta charged Mr Kejriwal of lying on the issue. "Delhi Chief Minister has lied big that EDMC was given Rs. 950 crore. The reality is Rs. 350 crore of this amount is loan on which Delhi government is charging interest at 10.50 per cent rate from the helpless EDMC," Gupta said in a tweet. Senior AAP leaders Dilip Pandey and Atishi also attacked Delhi BJP chief Manoj Tiwari, saying his mathematics was "weak" and he should apologise for saying that Delhi government was paid Rs. 48,000 crore by the Centre. "Tiwari's mathematics is weak. If he has any papers in support of his claim he should show us," Ms Atishi said. Recently, Mr Tiwari had stated in a tweet that Delhi government which was getting Rs. 36,776 crore from the Centre in 2014 was now getting Rs. 48,000 crore from it. "The Delhi government received only Rs. 325 crore from the Centre while it paid at least thrice the funds to EDMC in comparison to what was being paid to it in 2013-14," the leaders said. The civic body got Rs. 287 crore in 2013-14 and Rs. 396 crore in 2014-15, Atishi claimed. "However, the Kejriwal government gave Rs. 948 crore to it in 2016-17 and in the current year, Rs. 772 has been given so far," she said. Ms Pandey reiterated Mr Kejriwal's claim that Centre has to pay Rs. 5,000 cr to the municipal corporations. "The Centre pays Rs. 488 per person to the municipal bodies in the states but the same was denied to Delhi on the pretext that it was a union territory," he said. The Delhi government recently had told the Supreme Court that it would release Rs. 500 crore within two days to civic bodies, which will help resolve the crisis that has arisen due to the ongoing strike by sanitation workers of the EDMC. On October 4, the sanitation workers had protested outside Kejriwal's residence over the issue.